Are you loosing money because of rain right now?! It is a commonly held belief that windows should not be cleaned when it rains because the rain will just make them dirty again. Is this really a fact? The simple answer is ‘no’. Although in some parts of Europe and the UK many people believe having their windows cleaned when it rains is a waste of time, in the USA, it is normal practice for window cleaners to carry on in all weather except storms and high winds. Windows need cleaning because they get dirty not because they get wet. Back in the days when most houses had chimneys that were belching smoke, it probably would of been true that by the time the rain drops reached the ground they were full of dirt and smoke particles. With the Clean Air Act, that situation has changed. Nowadays the three major causes of dirty windows are dust, pollen and droppings. 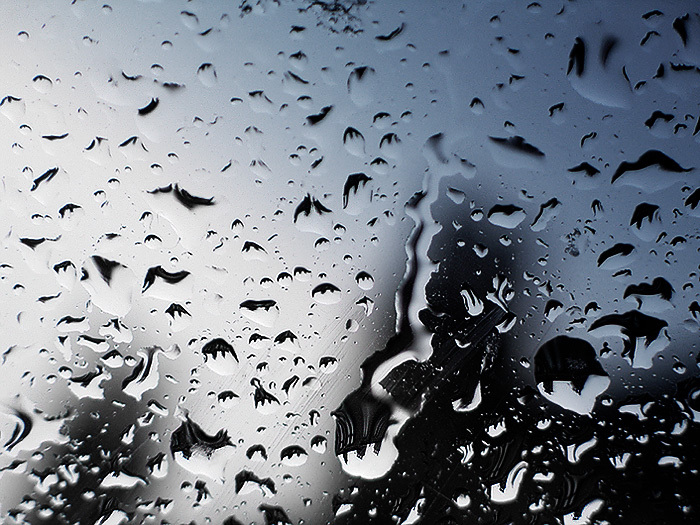 If these are present on the window glass when it rains, the residue in the rain attaches itself to the dirt and can often make the windows look worse. When windows are clean the rain will simply run off and the glass continues to remain clean. I convinced my customer who doesn’t like his windows cleaned in the rain to have his windows cleaned in the rain! It was only last week. We do this Fish and Chip shop every week. But he always turns my lads away when it is raining or about to rain. This has had happened a few times recently since the UK weather has been very bad. The Chippy owner is a nice guy, he just needed convincing. We actually clean his store front in and out the traditional way. Rain water is pure water. You can stick it directly into your water fed pole system and clean windows with it! I measured water from my dirty down pipe from the roof of my house the other day. The rain was lashing it down. It read 0004 on the TDS meter!! So, we turned up to this Chippy and the owner starts waving us away with his hand. I walked in and spoke to him, “the rain would not make your windows dirty again as the water is pure. In fact I will give you a rain guarantee. If you find any marks on the glass caused by the rain, I will come back and clean the windows again for free”. He smiled and repeated ” rain guarantee, ok”, we shook hands and got on with cleaning the windows. Knowledge is power. If you know with confidence the facts it will come across as you tell your customer. By putting your money where your mouth is, you are validating what you say. Once they see that you are right, you have won them over for every day you turn up and it rains. All that is left, is to consider if you want to get wet or not.